The mantra of "hands up, don't shoot" gained new force Friday, after the release of a cellphone video showing Ferguson witnesses just after Michael Brown's shooting. The super-brief footage, released by CNN this week, shows two construction workers who allegedly caught the whole thing, raising their arms in apparent mimicry of what they'd just seen. Though this just supports what other witnesses have been saying for ages — that Brown surrendered before being shot by Police Officer Darren Wilson — some are touting this as game-changing evidence. The video evidence harkens back to the initial version of events Ferguson witnesses gave police and reporters. 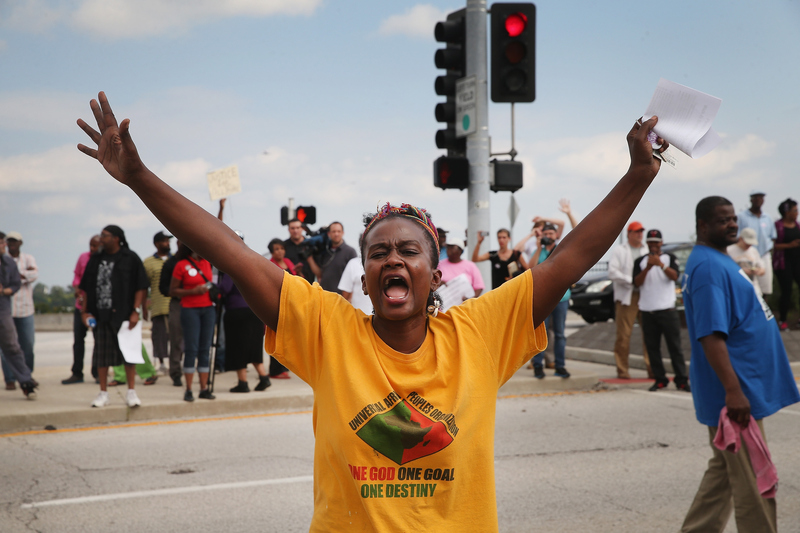 That story — that Brown was another unarmed black man, who'd put his hands up, clearly surrendering, before being fatally shot several times — is what spurred the chaotic weeks of protest in Ferguson and across the U.S.
"The cop didn't say get on the ground. He just kept shooting," one of the workers, who hasn't been named, told CNN. Later, in a separate interview with KTVI, a St. Louis TV station, he added: "When he [Brown] finally caught himself he threw his hands up and started screaming, 'OK, OK, OK, OK, OK, OK."
While all new evidence is definitely useful evidence, it's not clear whether this is really game-changing. For one thing, it doesn't show the actual shooting, it just purports to show the moments just after the incident — it's perfectly possible, though, that the video was shot half an hour later. It's also not clear how close the construction workers were to the scene; although they say now that they witnessed it quite clearly, the truth is, we can't tell that from the video. The video is of paramount significance, not just because these two construction workers are not Ferguson residents, and not because the construction workers were caucasian, but because it is a contemporaneous recording of their immediate actions of what they had just witnessed.It's the best evidence you can have other than a video of the actual shooting itself.It captures their raw emotions and their outrage over what they just witnessed. It is like you are watching a live play by play of what just happened." Nobody can say they have been influenced by anything, any media, or anything like that.And it corroborates what everybody is saying. That he put his hands up. That he was running away and the police kept shooting as he was running away. And that the police kept shooting when he put his hands up.